Frieden and Obama’s “prior ideological commitment”: Utilitarianism. Now, there are countless angles to approach this. There is, of course, the immediate problem. For the Christians in Houston, there are particular practical implications. I think that most readers, however, know that this is only a symptom. Now, for the pro-homosexual readers, it is a symptom of a good thing going on. In their eyes, it is about time the bigots got what is coming to them. On their view, this is on par with the KKK being told where (ironically?) to shove it. I suspect we might hear some of the gay marriage advocates decry this step as a threat to all of our liberties, not just those of Christians, but in the main I expect a collective shrug. It is hard to get all worked up about bigots getting persecuted after decades and even centuries of gays being persecuted, right? Check out the comments in the link provided above for some examples of this. I observe that this madness in Houston stems from two important developments. In the first place, you have the fact that Houston recently elected an openly gay mayor, Annise Parker. In the second place, the ordinance in question, the Houston Equal Rights Ordinance, or HERO, was passed by the city council. Notwithstanding the clear Constitutional prohibition of such actions (not that it matters anymore what the Constitution clearly says), we may ask ourselves, “Don’t people have the right to govern themselves?” In other words, the majority of the citizens of Houston elected Parker and the council that enacted these changes. Ostensibly, then, these actions reflect the greater will of the citizens of Houston. It may be argued that the citizens did not consent to this, as indicated by the collection of thousands of signatures in an effort to put the matter to a referendum. As I have learned from personal experience, elected officials will not easily allow something to go to referendum if they fear they may actually be reversed. They will lie, cheat, and reverse themselves, and otherwise do whatever it takes. If the elected officials in Houston felt they really reflected the will of the people on this, they would allow the referendum to go forward, as it would validate not just their policies, but their philosophies, and it would set the matter well beyond the reach of opponents. So, there is probably good reason to think that the mayor and council have bit off more than it could chew, and the mayor and council know this. But the time to have implemented the policies you desire was at the time of the election, at the ballot box. At that time, the philosophies of the candidates should have been vetted. In a representative system such as permeates the United States, decisions are not made in a purely democratic fashion, where each important issue gets decided by a straight majority vote. No, we elect representatives who operate on the fair assumption that the electorate backs the philosophy that the candidate will bring to the table. In short, the philosophy matters more than the policies. If you want to see the policies you like enacted in your city, then you elect people who share your philosophies. Bizarrely, this is understood very well by the enemies of the Christian worldview, and Christians themselves stumble about blindly reacting to symptoms, rarely turning to address the core issues. On the one hand, the enemies of the Christian worldview understand the power of the political process, where if you get over the initial hump of securing office, decisions can be legally made by small numbers of people. (In Houston, never mind the mayor and the council–the referendum signatures were thrown out because of the decision of ONE MAN. Think about that.) For people with this mindset, politics is their bread and butter. On the other hand, these people grasp that to get what they want, they need their philosophies to have the support of the populace. To attain that support, they will use any means necessary, but in practice the best case scenario is to create more people who share their philosophies. In other words, these people understand that they need to change the culture itself and orient it towards being sympathetic to their views. Once that happens, everything else that happens, happens inevitably. Not as the result of some sinister conspiracy, but because certain things rationally follow from certain propositions. Finally, recognizing the supreme importance of having their philosophies permeate the culture and not the Christian’s, they have taken certain practical steps to have the beliefs and attitudes of Christians characterized as ‘religious’ and, in their view (with Supreme Court backing), consequently a violation of ‘church and state’ if Christians do decide to engage the political process with the goal of seeing their own philosophies and policy preferences enacted. In effect, if Mayor Parker thinks that it is quite alright to compel churches and private organizations who allow the public to access their bathrooms make available their women‘s restroom to men, that is a purely secular matter, and entirely appropriate for citizens and elected officials to demand, whereas if you disagree, it is a religious issue, and therefore a violation of the Constitution’s supposed demand that ‘church and state’ be separate. This is the way it works all the way down the line. If you think that an organization like Catholic Charities should facilitate adoptions to gay couples, that is a secular aim. If you don’t agree, that’s religious–and therefore, not permitted. If you think that Christian businesses should have to participate in activities that patently condone homosexual behavior, even as far as compelling them to participate in the act of commemorating that behavior, such as by producing wedding cakes for gay couples, photographing their weddings, or hosting the weddings themselves, that is a secular matter: “The cost of doing business in public society.” If you disagree, that’s your religious conviction speaking, and therefore, precluded. And, oh, by the way, you are a bigot. But this sleight of hand is only possible if you have managed if large numbers of the populace go along with it. Since fewer and fewer people can actually read the Constitution, and those who can, can barely comprehend what they are reading, and since the Constitution only means what 9 folks in black robes say it means, it is not too difficult to pull this off. If you can also shift cultural sensitivities in your direction, the matter is virtually won, and you hardly have to concern yourself any more with the harder work of changing people’s philosophies. From all this, you may surmise that getting all worked up by the subpoena of communications by religious leaders is ultimately pointless. No doubt, it is worth being concerned about the steps after this step. Obviously, actual prosecution and incarceration have become incrementally closer. Probably, people other than Christians will ultimately be made to suffer, and probably, gays themselves will someday find themselves on the wrong side of an issue, and be made to suffer similarly, on account of precedent that they helped establish. The idea that we can stop the encroachment here, however, at this relatively minor manifestation, is absurd. So what is the solution? There are two obvious ones. 1., Christians need to become more politically active themselves, and by that I don’t mean protesting in the streets or trying to get signatures for a referendum. I mean, running for office and backing those who share your values. 2., #1 is pointless, unless the culture be changed so that it is more sympathetic to the philosophies that power the Christian worldview. These are two obvious ones, no doubt, but I am afraid even these are not sufficient. There is also #3. 3. Recognize that the use of government to implement one’s philosophical preferences is a double-edged sword that is more likely to be used against you than for you. The implication of #3 is that any Christian who decides to take #1 and #2 to heart, must make the goal of having a ‘limited government’ their burning desire. To understand why, let me submit to you another link, which is even more representative of the real ‘illness’ afflicting us than what is going on in Houston. And, even it is only a symptom! This bit of news came out a couple of days ago, although it is a little disturbing that anyone would find it news. There’s no formal consensus about what’s driving the numbers, but data shows that among young adults who say they do want to get married, the economy is an issue. 34 percent of them cite financial security as an obstacle to tying the knot. Economic reasons? Well, yes. But what is rarely understood, and certainly very often not by Christians (who are not primed to think in such terms), is that the economic influences have been engineered with an eye towards undermining traditional marriage. What is better? Convincing the populace that traditional marriage (pardon the redundancy) is a hindrance and obstacle to the ‘greater good’ is a difficult thing to do. If you just outlawed it and eliminated it by fiat, there would be an unsurvivable outcry. But if you created the conditions by which people ‘voluntarily’ chose not to marry, or commit themselves to a paradigm that elevates the ‘traditional marriage’ model as the ideal, then people do what the social engineers want them to do, while thinking that it was their idea all along. [civilization has the tendency] to eliminate its ablest people. This has happened in the past, and is certainly happening now, and if it is always to happen, it signifies a recurrent degeneration of all civilizations, only to be renewed by the incursion of barbarians who have not suffered similarly. If any civilized country could overcome this effect, so that it alone retained both its ability and its civilization, it would certainly become the leading nation of the world. Man is a wild animal, and cannot accomplish this by using the methods of the animal breeder, but may he not be able to devise something that would go beyond the long-drawn-out automatic processes of Natural Selection? I think he can. A cruder and simpler method must be used than the animal breeder’s. Something might be accomplished on the line of what is called “Unconscious Selection” in the Origin of Species. All that it would take is for someone with this mindset to decide that perhaps one might be able to adopt an economic for “quite other reasons” with the intended, but unannounced and unpublicized, result, and then something like the institution of marriage becomes an instrument in the hands of social engineers. To put it bluntly to my Christian conservative friends, it is no good to engage the political process with the thought that we might be able to preserve some government functions that outwardly are friendly to Christianity, religious liberty, liberty itself, etc. Every and any governmental program represents, in the eyes of those on the other side of these issues, a lever by which society can be managed and shaped. And that includes a state enforced and supported notion of marriage as consisting of a monogamous relationship between one man and one woman. As this essay has already grown lengthy, let me jump from Darwin, writing in the mid-1950s, to Frederick Jaffe, writing in 1969 in a memo to Bernard Berelson, head of the ‘Population Council.’ The Population Council was co-founded by one of its early presidents, Frederick Osborn, from whom I drew the phrase “voluntary unconscious selection,’ which he coined around the same time Darwin was saying something similar. We need not dwell on other ideas, such as adding fertility control agents into the water supply and compelling women to get abortions. As Jaffe was a vice-president of Planned Parenthood, such ideas may cause some consternation in the minds of some. For our purposes, take a look at the list and ask yourself whether or not we are further away or closer to seeing some of these ideas actually manifested in society. In the minds of people like Jaffe and Berelson and all the rest, government programs and policies are tools for social engineering. Unless such folks are going to be thoroughly driven from the halls of power and replaced by people with an entirely different perspective (ie, ours), then it will always prove unwise to have our government involved in any endeavor, period. Some government is necessary, but still vulnerable to such machinations. But a smaller government is easier to monitor and hold accountable, and it is easier to pay attention to who is in charge and what their beliefs and values are. I feel I must add, though it is an aside, that Jaffe and Berelson worked together on the 1969 Rockefeller Commission report authorized by Richard Nixon, which fleshed these themes out further. A couple of years after this, Rockefeller prompted Nixon to put the Federal government on the job, and Nixon tasked Henry Kissinger to develop a foreign policy initiative aimed at depopulating a number of countries. This national security position was declassified eventually, and is called NSSM-200. Not incidentally, this early 1970s foreign policy decision takes pains to say that what they plan on doing to other countries is justified by the fact that they will take the same approach in the United States. I cannot dwell on this here. My point in mentioning this is to illustrate that we miss the point entirely if we focus our efforts on ‘tweaking’ the current system, when in fact the folks on the other side of these issues are using the very system itself to effect their desired changes. And, frighteningly, even that is only a symptom! We have not, even now, arrived at the true source of the problem. I have invested too much time already on writing this, so rather than elaborate on that problem, let me say that it has a fairly simple solution, which I will append to my list above. If consistently implemented and sustained in the long term, this solution will accomplish #1-3 above at the same time. #4. Have lots of babies and raise them all to have a thoroughly thought out and considered Christian worldview. 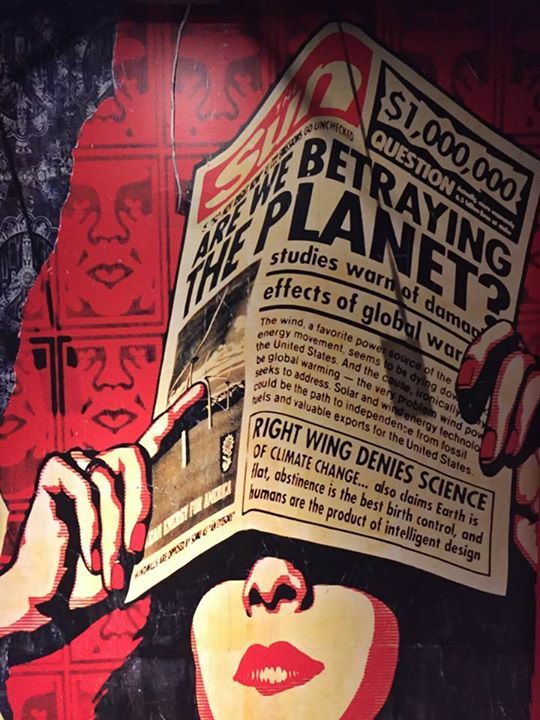 But if you are eager to get to the bottom of things, consider this picture of a mural that someone saw on a wall. Evidently, those on the other side of these issues see some connections that Christians, sad to say, have yet to recognize. Study this image carefully, and see if you can figure out for yourself where the root of the problem lies. I support the right to free speech of people whose opinions I may find obnoxious. Not being part of the demographic this blog is addressed to, I will not comment on anything else. In the meantime, we’ll be lucky if your fellow travelers don’t end up throwing the lot of us into the gulag. That would be a much greater comfort, DB, if such people in power who arrested Tony Miano and Ake Green felt the same way. I’ll bring you some soup. Frog soup, no doubt. But not crow.